Although studies suggest that hemodiafiltration (HDF) may reduce cardiovascular mortality in adults, data in children are sparse. In this observational multicenter study, the authors compared HDF and hemodialysis (HD) in children with ESKD, finding that annualized changes in well validated subclinical markers of cardiovascular disease, including carotid intima-media thickness SD scores, were lower in HDF and associated with lower 24-hour ambulatory BP and intradialytic weight gain. Height increased only in the HDF cohort. Compared with the HD cohort, the HDF cohort also had better self-reported outcomes, with fewer headaches, less dizziness or cramps, and shorter recovery time after dialysis sessions. The study provides proof-of-concept data that HDF is a safe treatment that may have benefits over conventional HD in children. A randomized trial is required to confirm these findings. Background Hypertension and cardiovascular disease are common in children undergoing dialysis. Studies suggest that hemodiafiltration (HDF) may reduce cardiovascular mortality in adults, but data for children are scarce. Methods The HDF, Heart and Height study is a nonrandomized observational study comparing outcomes on conventional hemodialysis (HD) versus postdilution online HDF in children. Primary outcome measures were annualized changes in carotid intima-media thickness (cIMT) SD score and height SD score. Results We enrolled 190 children from 28 centers; 78 on HD and 55 on HDF completed 1-year follow-up. The groups were comparable for age, dialysis vintage, access type, dialysis frequency, blood flow, and residual renal function. At 1 year, cIMT SD score increased significantly in children on HD but remained static in the HDF cohort. On propensity score analysis, HD was associated with a +0.47 higher annualized cIMT SD score compared with HDF. Height SD score increased in HDF but remained static in HD. Mean arterial pressure SD score increased with HD only. Factors associated with higher cIMT and mean arterial pressure SD-scores were HD group, higher ultrafiltration rate, and higher β2-microglobulin. The HDF cohort had lower β2-microglobulin, parathyroid hormone, and high-sensitivity C-reactive protein at 1 year; fewer headaches, dizziness, or cramps; and shorter postdialysis recovery time. 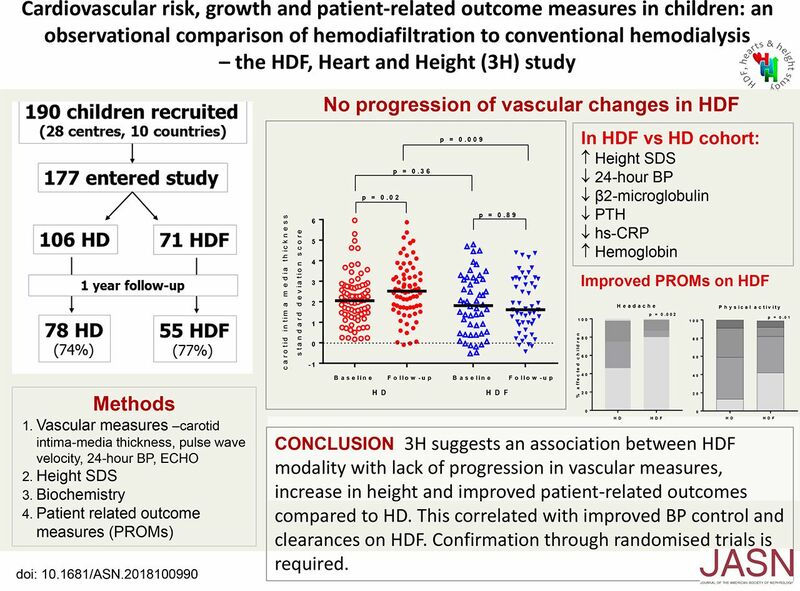 Conclusions HDF is associated with a lack of progression in vascular measures versus progression with HD, as well as an increase in height not seen in the HD cohort. Patient-related outcomes improved among children on HDF correlating with improved BP control and clearances. Confirmation through randomized trials is required.